Hubert Who? The incredible life of unsung adventurer Hubert Wilkins. War hero. Polar explorer. Spy. The amazing life of Sir Hubert Wilkins, Australia’s greatest unsung hero. He shot the world’s first movie footage from an aircraft (while strapped to its fuselage); and was the first to fly over both polar icecaps. He was the only member of the media ever to win medals for gallantry, during World War I; the first man to attempt to take a submarine under the North Pole; a spy for the British in Soviet Russia and the Americans in the Far East; and an enlightened friend to Aboriginal people in outback Australia. Yet this South Australian farm boy is barely acknowledged in his homeland. 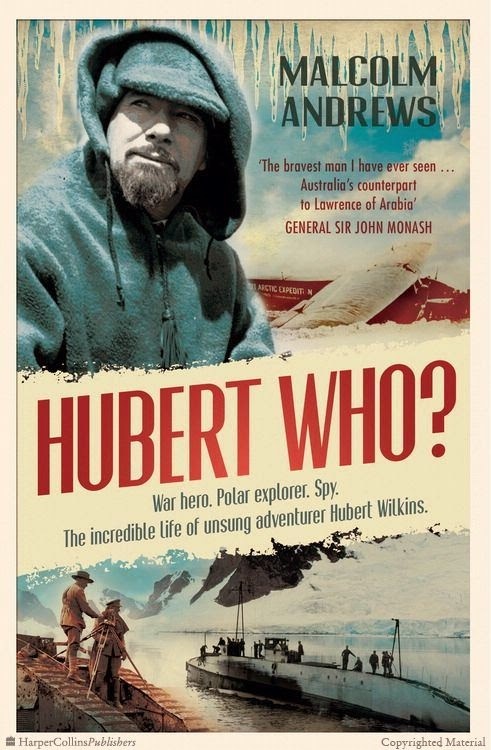 Explorer, pioneer aviator, war photographer, naturalist, meteorologist, student of the paranormal, secret agent and the last man from the West to meet with Lenin … Sir Hubert Wilkins’ life was an amazing adventure, packed with exciting and extraordinary experiences. How can a man who achieved so much be so little remembered? Malcolm Andrews is an author and journalist with 50 years experience in Australia and overseas. He is the author of 27 books, including The Fabulous Fairstar and From Russia with Gloves, boxing champ Kostya Tszyu’s ghosted autobiography.